Nicole Richie was at the store Kitson on Melrose Avenue yesterday avenue to do a special meet and greet to promote her collection of jewellery, House of Harlow 1960. Nicole Richie was channeling a greek goddess look, in a long cream dress, tan gladiator style sandals and wearing all her own House of Harlow 1960 jewellery, from head band, to rings, necklace and tons of bangles. 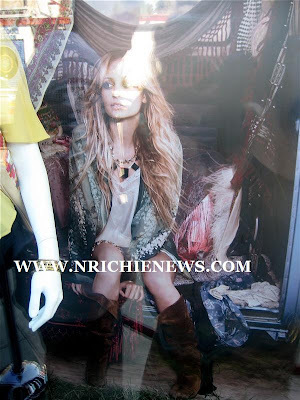 Nicole Richie has recently stated that her first edition to the House of Harlow 1960 collection is "very indian and african inspired." Alot of lucky fans got to actually meet Nicole, i'm way jealous! The store window, i can't wait to see the high quality images of this photoshoot ..
Did you attend the meet and greet at Kitson yesterday afternoon !? Kitson is currently available instore at Kitson on Melrose and you can also buy it online. Click here to see the current stockists of House of Harlow 1960. Big thanks to Taylor for supplying some of the instore pics! omg, she's sooooo beatiuful !!! !